1. Peel and quarter potatoes. Boil potatoes in 6 to 8 cups of water in a pot or large saucepan for 30 to 40 minutes or until soft. 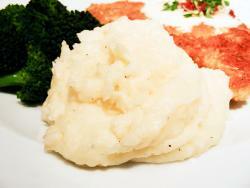 Strain potatoes, then add them back to the pan and mash thoroughly. 2. Add cheese, cream, butter, salt, and pepper and heat over medium/low heat, stirring often, until thick. Recipe from Top Secret Recipes.